I’m one of those people that can only shave their legs sitting down. I don’t know why, but I just never mastered shaving while standing on one foot in a wet and slippery shower, so I’ve always made shaving my legs a part of my bath experience. From the time I was in middle school I’ve take warm baths almost every night before bed. I grew up dancing competitively so that meant long hours at the studio. When I would get home from a long practice I would be SO achy and all I wanted to do was soak in the tub. Taking a bath and shaving my legs became apart of my nightly ritual before bed and I still do it to this day. There’s nothing better than hopping into your sheets with fresh and smooth legs!! Now that I’m a mom, I really appreciate the quiet and relaxing time I have to myself each night. I light a candle, turn on music and throw some bubble bath in and unwind. I grew up in a house of all girls so over the years I’ve tried A LOT of different brands of shaving cream. I’ve found that so many brands would dry my skin out like crazy!! At one point I started using conditioner because my legs were getting so dry and I thought maybe the conditioner would help moisturizer them while I shaved. 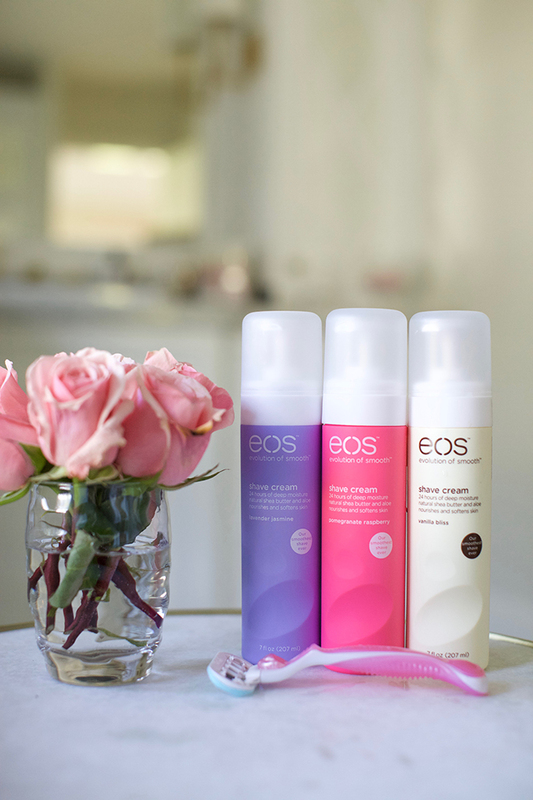 A few months ago I got some EOS products to test out, including their shaving cream. It’s become one of my favorites because it’s still thick and creamy like a typical shaving cream but it is SO moisturizing (no really, it’s incredible)!!! Sometimes when I would use conditioner or soap, I would end up cutting myself because it wasn’t thick enough so I love that EOS still has the thickness but leaves my skin feeling so smooth and hydrated. Such a cute display and nightgown Rachel. I love EOS, I always carry a lipgloss in my bag. That EOS shaving cream looks so thick and luxurious, I definitely want to check it out as my skin gets really dry from shaving. By the way your bathroom is to die for, if that was my tub I’d never get out! I love the ESO lip balms- I will definitely have to try the shaving cream! I have very sensitive skin and have had trouble finding a good shaving cream. I started using conditioner as well but then it started irritating my skin. I may have to try the EOS shaving cream now! 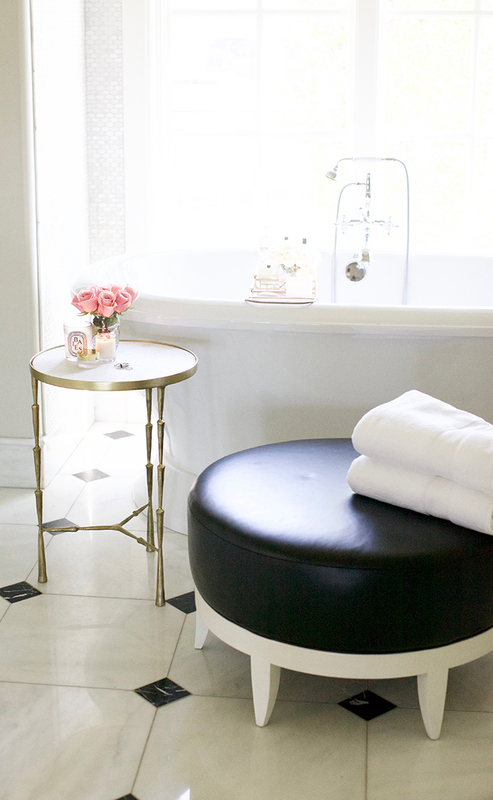 Also, your bathtub is absolutely gorgeous and I love the gold tray! Your bathroom is so pretty! 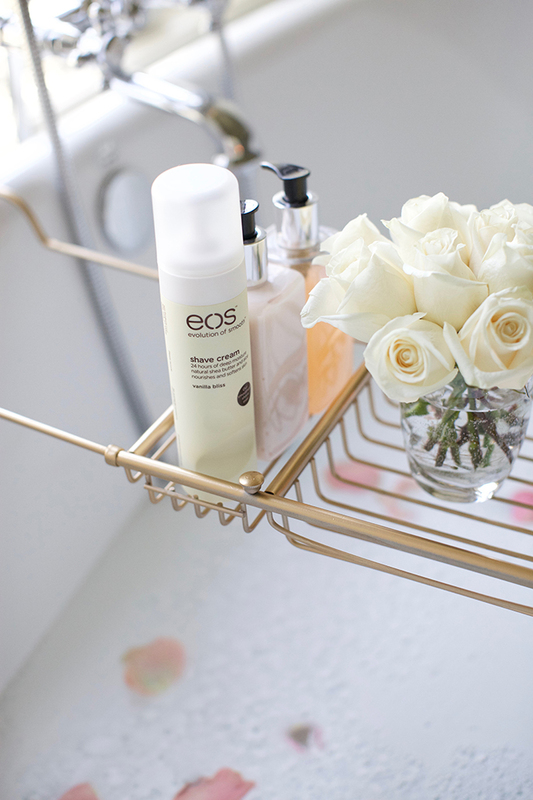 EOS is one of my favorite skin care brands, but I have never tried their shaving cream. I will have to check it out. I take baths all the time. It’s my favorite way to relax! 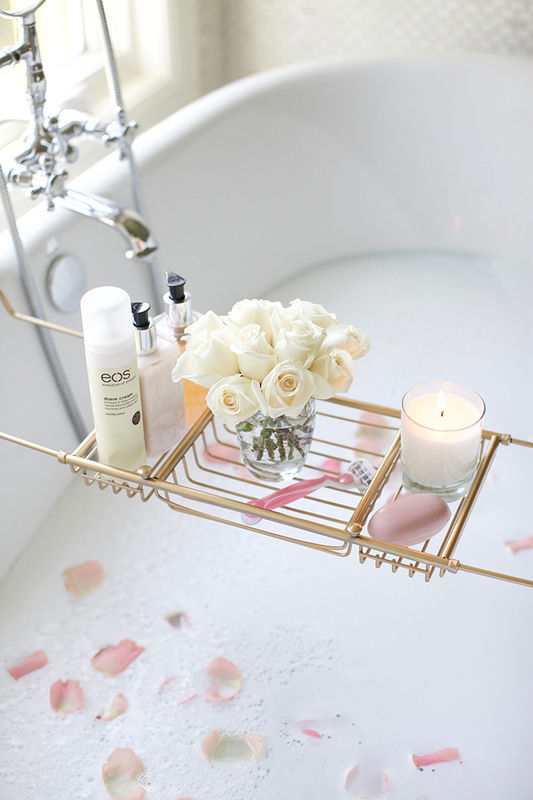 I love the bathtub tray- where is it from? That’s a great idea. You are so cute. That’s so funny I have a hard time too shaving my legs in the shower. I always do it in my sink. luckily I did laser and don’t have to worry about shaving anymore! What a relaxing bathroom! I have to try this cream from EOS. It sounds great! you have the cutest house!! I love scrolling through your home pics!! Thank you Jenessa! Its our home and we really love it. Gorgeous pictures (and bath tub!) do you know where the gold tabletop is from?! Glad I’m not the only one who needs to sit down! Gonna try this shaving cream ASAP too! I love all the photos! Everything looks so pretty and relaxing! I think I will have to try their shaving cream as my legs get very dry as well. Why is it that when a lady, who is pregnant, always, always holds her stomach? It’s not like the baby is gonna fall out! You must have never been pregnant before :) My belly can get so big I feel like I need to help hold it up. ha ha. It helps relieve some of the pressure. Hi Emily! I bought it from Bed Bath and Beyond and I spray painted it gold! Have never tried Eos but I want to! Yes you should! It works wonders! Thank you! Thanks! I bought it at Bed Bath and Beyond. It was silver and I spray painted it because I couldn’t find any either! I have never had the luxury of naturally soft legs. I’m going to have to try this. But if you shave in the bath aren’t you soaking in floating leg hair and shaving cream? Or do you shave last and then rinse off? Asking cuz I want to try! I need to sit while I shave too. I can’t remember the last time I enjoyed a nice bath instead of showers. Your post makes me want to go soak in a nice warm tub! I love EOS products, especially this shave cream! Great photos, as usual! There has always been the same problem with me while shaving my legs, the skin afterwards was soooo dry. I am going to try the EOS out as well. Yes try it! Thanks for commenting! I use conditioner too, mostly because I just forget to buy shaving cream. I use the EOS lip balm and it’s so good and I know my sisters use the shaving cream too. Hi Rachel! I have never tried this shaving cream. Thank you for sharing! I always used conditioner because it makes my legs so smooth, but I’m going to have to try EOS! Their lip balm is my favorite, so I’m sure the shaving cream is dreamy! I’ve heard a lot about EOS products..I definitely need to check out their shaving cream! Love the fact that it’s moisturizing! Thanks for sharing! Love EOS products but never tried their shaving cream before! It’s on my list now! Your bathroom looks amazing by the way! These pictures are to die for! Love your bathroom! That bathtub is a dream. I’m looking for a cute bath tray for our place, but can only find silver or bamboo ones. Where did you find your gold one?? Thank you Erika! I actually got it from Bed Bath and Beyond. It was silver and I spray painted it because I couldn’t find any either! I still use conditioner to shave my legs, works like a charm! Your bathroom is seriously gorgeous! I use vanilla bliss shave cream and my legs are super soft. What is the brand name of the razor that you use? Your images are just beautiful, as is your home!! I love the accent table! May I ask where it’s from? Thanks! Its from Lulu and Georgia! Love your bathroom details :) Can you please tell me where did you get the gold round pendant fixture and the gold side table please?! Loved the way you did it. I am going to follow the same method next time. The method that I follow is very painful and cause itchyness. Thank you ! This really helped me achieve super smooth legs ? Which gold spray paint did you use? This is the perfect color!